It's great how little improvements can make a huge impact on your space, isn't it? Our decorating goal for 2007 should be to get creative in decorating instead of heading for the easy out - things that are already made and ready to install. I don't mean we have to go nuts here, but let's at least try out a few new ideas, okay? One thing that comes to mind are window treatments. You can use tea towels as cafe curtains - a no sew version is to add clip rings to the tops and put them on a rod. Easy. Linens are pretty, and look for a tea towel that is around 17 x 22". Two of these are all you'll need for a single window. Or, if you need curtains for your bedroom or living room, you can use a twin sheet to create a single panel (or a full if you like more of a gather). Just flip the sheet upside down (depending on the pattern, of course) so the wide hem puddles on the floor and the thin hem is at the top, where you will simply add clip rings to hold it onto a rod. You can also hang the sheet the correct way if your pattern demands it, with the wide hem on top, just open up the hem on each side of the sheet and put a rod through the newly formed pocket. Again, very easy and no sewing machine required. 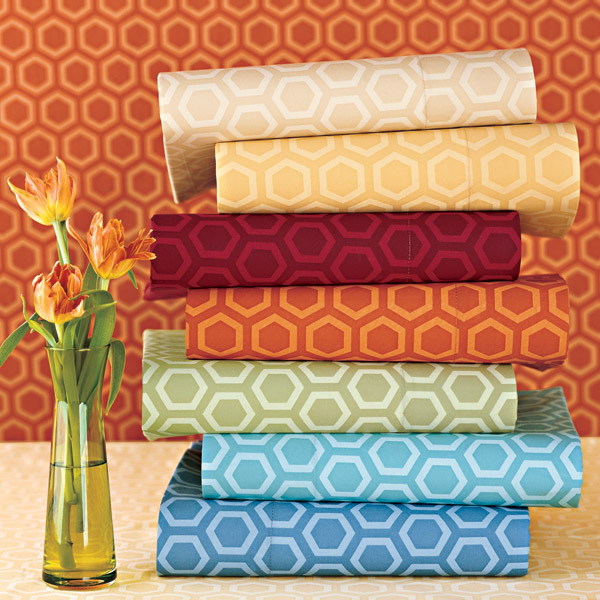 If you have a good eye for print and pattern, your sheet curtains can add a lot of beauty to your space. Can't find sheets that appeal to you, or perhaps you're looking to use something different like chenilles, velvets, brocades, or heavy cottons? A quick change for any living space is to add simple tab top or rod pocket curtains. Although this may not be a DIY project, it a budget solution for a tired room. Try to locate some inexpensive $20 panels. Target has some beautiful and inexpensive ones, so do other stores likes Pier 1, even the Martha Stewart brand at Kmart is nice. A simple curtain swap for Spring can breathe life into a tired space without breaking the bank. Remember, you don't have to spend a fortune to give your space a quick facelift. With bed sheets, you can create a cozy grown-up space in a single afternoon. Tip: Always wash sheets after purchasing them, as this will soften the fabric and help remove the creases. Apply a hot iron before hanging. 200+ thread count cottons work best. Avoid sateens and flannels. Please measure your windows before purchasing. Some windows are much larger than the standard sizes found in most homes, and others are much smaller. BTW - If your windows are tall, you can always take out the wide hem for extra length or look for extra long sheets.